Ever since I began reading Jo Nesbo’s Harry Hole series, I’ve had this pipe dream of traveling to Oslo, Norway and following in Harry’s footsteps around the city. Well, this past weekend, that dream became a reality! After Krimfestivalen (the crime fiction festival I attended while in Oslo) concluded, and thanks to a very patient friend of mine who helped direct me around the city, I spent an afternoon walking around Oslo and visiting the locations that Harry Hole frequents in Nesbo’s series. I have to tell you, this was one of the coolest things I’ve ever had the chance to do! The spots from the series looked exactly the way I imagined that they would—I could practically see Harry walking the same streets I was. The weather was also perfect the day of my walking tour: it was overcast and a bit gloomy, which totally fits the atmosphere and mood of Nesbo's books. I just loved immersing myself in the world of my favorite crime series! Visiting the locations from the series also completely enhanced my appreciation of Nesbo's writing, as I discovered that his descriptions of Harry Hole's city perfectly capture it in both its appearance and mood. If you’re new to the Harry Hole series, remember to check out my Beginner’s Guide to Jo Nesbo so you’ll know a bit more what I’m talking about in this post! Without further ado, follow me around Oslo as I walk in the footsteps of Harry Hole! I can’t imagine a better place to start exploring Oslo than with a stop at the Royal Palace. I was blown away by the sheer grandeur of this building. It’s not opulent, but it’s certainly imposing, and the view looking from the palace down Karl Johans Gate (a main street in Oslo which also appears in the Harry Hole books) cannot be beat! Readers might remember the Royal Palace as the backdrop to the intricate and addictive plot of THE REDBREAST (Harry Hole #3), in which Harry must figure out who has smuggled a rare rifle into Norway, and on whom they plan to use it. 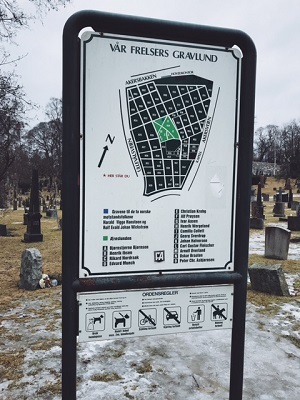 I had to laugh about this location—every single day of my weekend in Oslo, I walked through this square on the way to Krimfestivalen, and I didn’t put two and two together that this was the square from the Harry Hole books until the day of my walking tour! This square appears in many of Nesbo’s books (and is completely stunning). Perhaps most notably, this book is the backdrop to a murder in THE REDEEMER (Harry Hole #6), in which Christmas shoppers are stopped in their tracks when a shot rings out in the square, and a young Salvation Army officer drops dead. THE REDEEMER is one of my personal favorites in the series, so imagine my surprise when I realized I'd been walking through this square every day! This tour stop is pretty self-explanatory! What a striking building, though. It’s much more modern than I anticipated - but still very imposing. This cemetery was one of my favorite stops on the tour. It’s completely beautiful, and also completely haunting. While visiting the graveyard, you can easily imagine it providing a backdrop to any number of crime stories! It’s a huge graveyard, with incredible views when you climb up to its highest point. 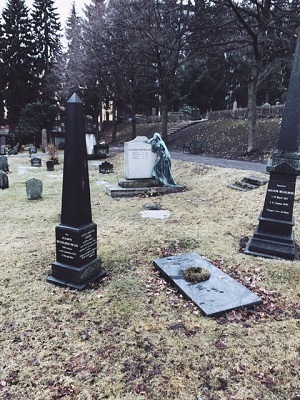 This cemetery is also the final resting place of a number of famous Norwegians, including Edvard Munch and Henrik Ibsen. 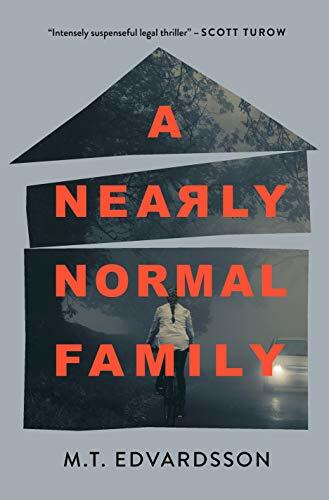 Nesbo fans will also be interested to hear that the cemetery is close to the apartment in THE DEVIL'S STAR (Harry Hole #5), where the routine examination of water leaking from an upstairs apartment becomes an investigation into a young woman's murder. If you’ve read the Harry Hole series, you’ll know exactly the significance of this restaurant! This is Harry’s favorite local haunt, and I’m pretty sure I freaked out some locals when I dashed across the street upon spotting it! I was beyond excited to see it in real life. This restaurant is described countless times throughout Nesbo's series, and is located just around the corner from Harry’s apartment both in the books and in real life. The Underwater Pub is another local haunt for Harry - this pub is his "home away from home" when he believes he's not welcome at Schroder's. Unfortunately, the pub was all boarded up when I walked by, but I did manage to snap this photo of the front window! Harry Hole’s apartment building!!! This was by far my most-anticipated stop on the walking tour. The street where Harry’s apartment is located is very quiet and kind of tucked away, and I was so excited to walk the path from Schroder’s to his apartment—a path that he walks so many times in the books. To make things even more amazing: the apartment building has Harry Hole’s name listed on its door!!! He even has a working buzzer. Yes, I did ring the buzzer—sadly, no one answered! I absolutely loved my adventure around Oslo following in Harry Hole's footsteps. I've never done anything quite like this before, and found it so fun to immerse myself in the landmarks of my favorite crime series! Now, as I begin reading Nesbo's newest Harry Hole thriller, THE THIRST (Harry Hole #11, on sale 5/9/17), I'll absolutely carry these mental images with me, and have a newfound appreciation for the places Nesbo describes. I owe a huge thanks to my friend Eirik, who took the time to show me around to all these different spots!